MILWAUKEE — James J. “Jim” King, longtime president of Kalmbach Media’s predecessor firm, Kalmbach Publishing Co., died Friday, July 20, at age 95. 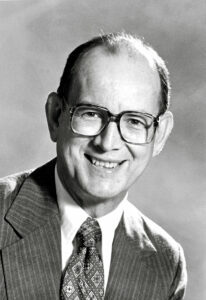 The company was only 20 years old when founder Al Kalmbach hired King as controller in 1954. He became executive vice president in 1963 and was named president in 1965, a job he would hold for 22 years. King later joined Kalmbach’s board of directors, a position he held until November 2012, for a total of 58 years with the company. Devoted to the company and its mission, King used his financial and managerial expertise to lead Kalmbach from challenging times in the mid-1960s to much greater success in the 1980s, capped off by KPC’s acquisition of Milwaukee-based AstroMedia Corp. in 1985, which brought Astronomy magazine into the company’s fold. King faced difficult decisions during his tenure as president, but colleagues and employees knew him as a positive, fair-minded leader who brought passion to his job as a publisher. King came by his interest in railroads honestly — his father, Robert King, worked as a locomotive engineer for the Milwaukee Road out of the family’s hometown of Green Bay, Wis. That led to countless conversations between King and Morgan, mostly about steam locomotives. King occasionally joined Morgan on business trips for Trains. Jim King was born and raised in Green Bay and later attended Lake Forest College in Lake Forest, Ill., where he would meet his wife of 59 years, Betty Peterson King, who survives him. They were married in 1949 and later moved to Milwaukee when he got a job with the accounting firm Arthur Andersen.